Internationally acclaimed rock band Kensington will feature in the opening concert of the annual Drakenboot Festival this year, taking place in Apeldoorn from 22 - 24 June. All-in-all there will be 7 bands taking part in the opening concert. 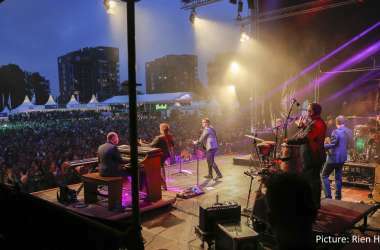 The Drakenboot Festival is one of the top annual events in Apeldoorn, drawing up to 100,000 visitors. Wittenborg University of Applied Sciences, headquartered in Apeldoorn, has always supported the festival, and its students have often been involved in the event. In 2015 for instance, students collected data from visitors and on how to improve the festival. The main event is of course the races between the different boats on the canals with thousands of spectators cheering them on from the banks. Drakenboot racing is an ancient Chinese tradition whereby different teams race each other in colourfully decorated boats. The festival officially kicks off the summer season in the city, so is not one to be missed!